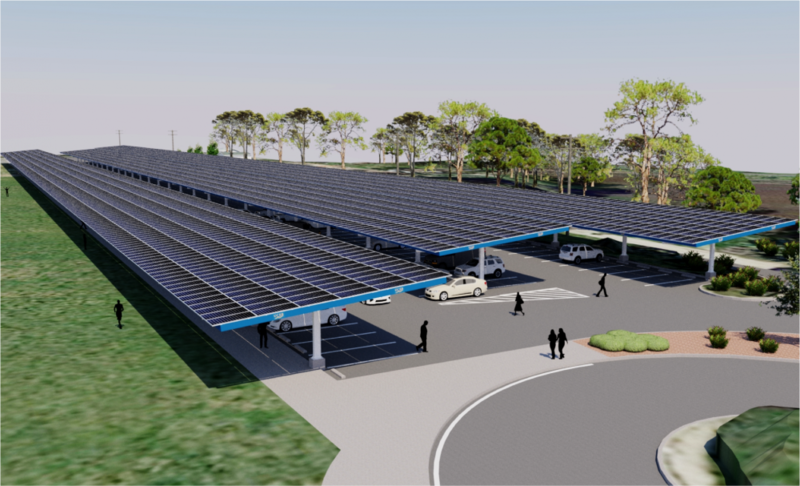 A rendering of the solar array that will be installed atop campus parking lot 10, the Elings Hall garage, in the new partnership between UCSB and solar provider SunPower. An artist's rendering of the surface carport-style array to be installed at campus parking lot 38, adjacent Storke Field. 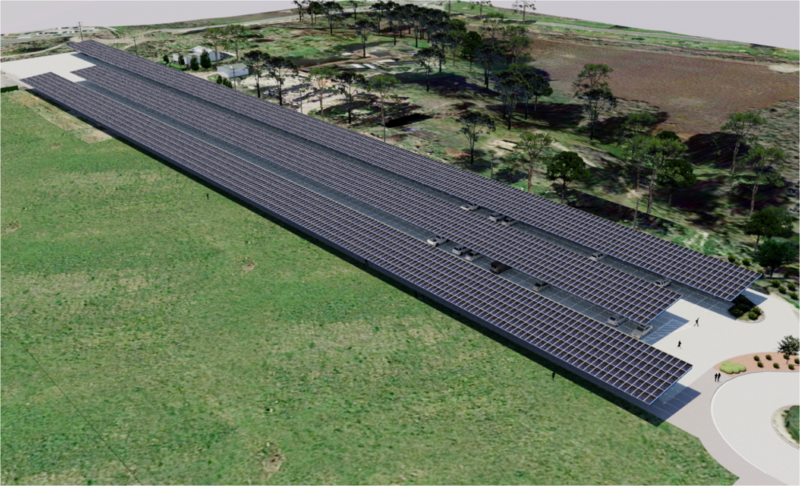 An aerial view of the planned solar array for lot 38 near Harder Stadium. 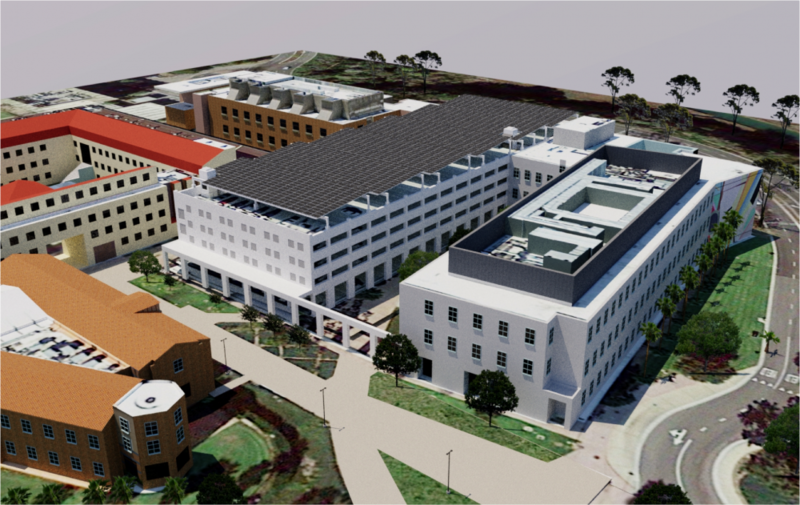 In a move that is estimated to cut total greenhouse gas emissions from campus energy use by 6 percent — and potentially save the institution millions of dollars in energy costs over time — UC Santa Barbara is partnering on an expansive new solar project. Six new solar arrays will be installed at UCSB as a result of the agreement with Silicon Valley-based SunPower, a global solar technology and energy services company. SunPower will erect, operate and maintain the arrays and sell the harvested green power to UCSB at a significantly lower rate than what the campus currently pays for electricity. UCSB estimates the project to net the campus savings of nearly $270,000 in its first year, with the potential to save some $14 million over 20 years. Most importantly, as the campus and the University of California at large advance on a goal to be carbon neutral by 2025, the new deal will yield UCSB a 6-percent reduction in its operational greenhouse gas emissions. Once installed, the new system will produce about 12 percent of the campus’s total electricity use. “It’s a remarkable achievement and a key step in our efforts to meet the University of California and President Napolitano’s mandate to become carbon neutral by 2025,” said Marc Fisher, UCSB’s vice chancellor for administrative services. “This is good for the university and good for the campus, which is deeply committed to sustainability. New roof-mounted arrays are slated for Robertson Gym and the Events Center, while top-deck carport arrays are planned for Lots 10 (Structure II), 18 (Mesa Structure) and 50 (San Clemente Structure). A surface carport-style array will be installed at Surface Lot 38, the largest of the sites, which is between Harder Stadium and Storke Field. In terms of solar energy generation, the new project is more than 10 times the size of that installed at Parking Structure 22 in 2014 and will, in aggregate, produce more than all of the campus’s existing six arrays combined. The total size of the system is 5.3 megawatts, which represents approximately one-third of UCSB’s peak electrical demand. With utility rates projected to increase by approximately 3 percent annually for the coming decade, and a marked decrease in the cost of installed solar generation, Sager said the agreement with SunPower made perfect sense. The company was awarded the contract after a lengthy feasibility analysis and competitive process dating back nearly 18 months. The project is tentatively scheduled to start construction in the spring at Rob Gym, the Events Center and likely Lot 38. Most of the work on the three parking structures should begin in mid-June, following commencement. The system is estimated to be running and generating power by the end of 2016.